Digging up Judy, I discovered I actually did have two more plates worth of costumes drawn for this volume. There were still four more that I had intended, but didn’t draw. The ones that I did, however, I might as well share–even if they aren’t the most glamorous. 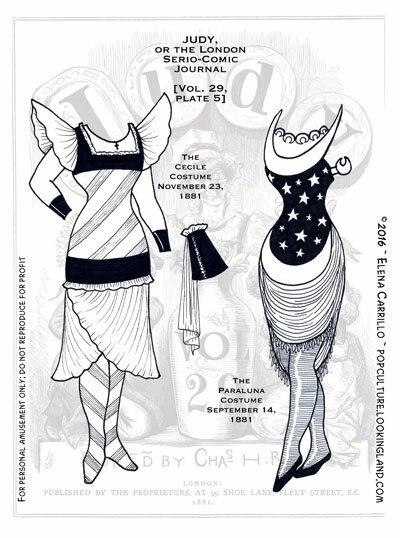 The “Paraluna” costume here was rather lovely in Chasemore’s original drawing and included an interesting rectangular parasol. I not only made a hash of the dress itself, but then bailed on the accessory. Not one of my finer moments ~ ha! But I’m trying to post stuff even if it’s not to my (already low) expectations. I remind myself that just because I don’t like something doesn’t mean other people might. I redrafted the Judy dolls, but I’m kind of torn about replacing them (the new ones are prettier, more delicate, but essentially the same pose). On the one hand it seems silly to trade horses mid-stream, but at the same time, I think the current couple of dolls have had a pretty good run. New year: new dolls. Seems like a good idea. I was hoping to sort it out over the holiday, but lost the weekend in visiting and enjoying other stuff.